I debated about heading to Salzburg. I was very, very excited about it before we came over, but with Bob not feeling well, the two hour train ride and the forecast for rain, I just wasn’t sure. We headed out early and we’re lucky enough to be relatively alone in the train car for the trip. 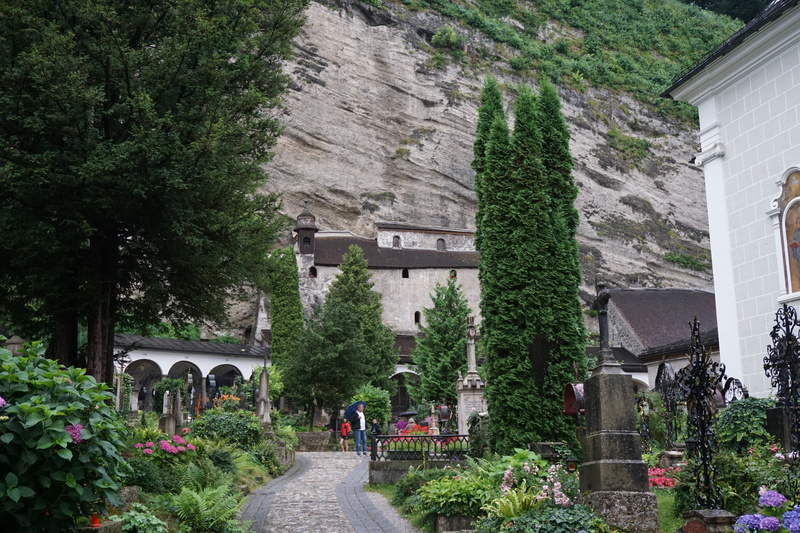 The scenery alone was worth going for, but once we arrived in Salzburg our adventures began. Bob had been saying he needed insoles for his shoes for a few days, but we never got around to getting any. I suggested he look for another pair of shoes so he could alternate, but he didn’t want to do that. About 300 meters from the train station in Salzburg, he didn’t have much of a choice. Yep. 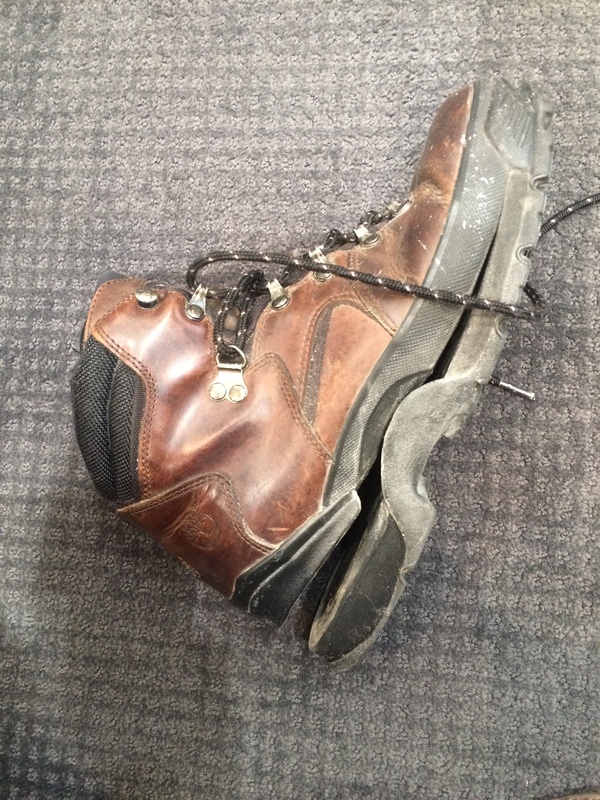 The sole of his shoe split from the shoe itself. There was no way he could walk around all day like that. Luckily we are in a major city and there are lots of stores – if we can find them. We did, Bob got a new pair and we headed into the old city to explore. On the map, Salzburg looks huge. When I planned the day I thought getting from one place to another would take some time, but it really didn’t. 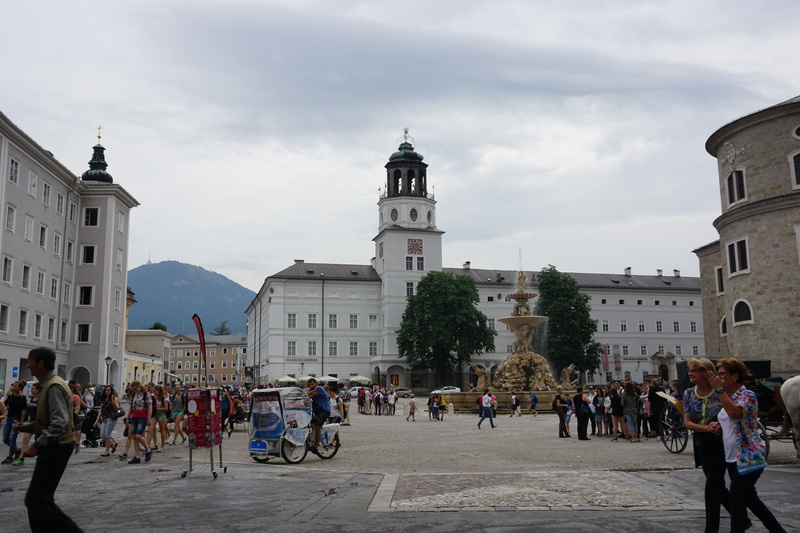 From one spot in the square you are within rock throwing distance (not that I would rough rocks) at the Cathedral, the Residenz, the monastery and the Salzburg museum. Further afield, a up a very large hill, is the fortress. We started with a small church, mainly because we ran into it and I wasn’t sure if it was the cathedral or not. (My map reading skills are questionable) it was a beautiful church. We found the cathedral and went in to explore. This church was majestic. It feels weird to say it wasn’t as grand as the Cathedral at Sienna (my standard for churches); it was just as ornate in a totally different way. 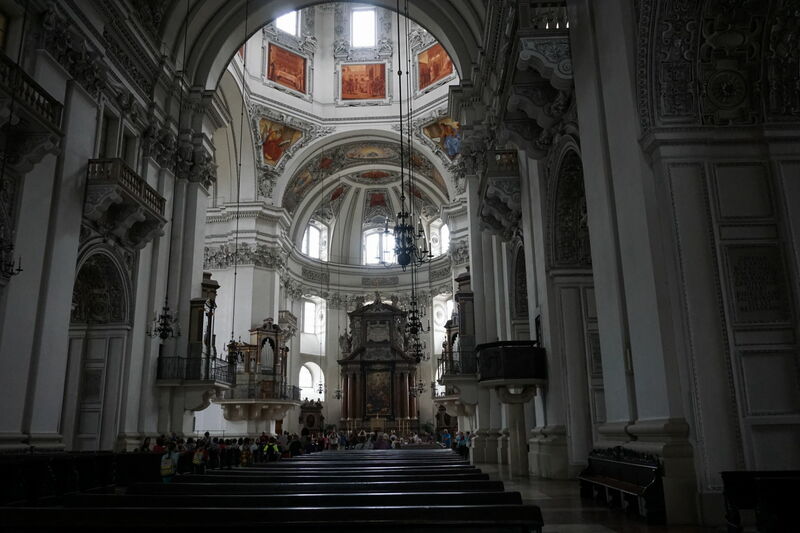 While Sienna is marble and carved stone, Salzburg is carved plaster and all of the detail blend into the building. 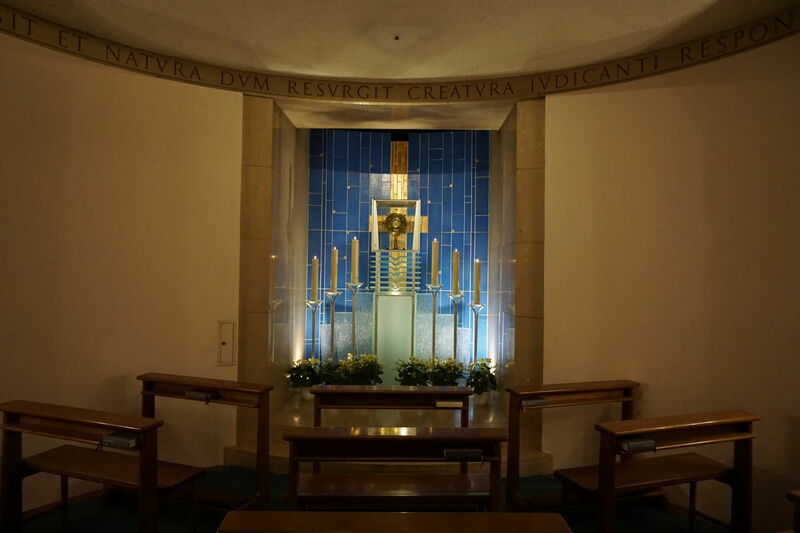 It is still impressive and it still shows the wealth and power of the Catholic Church, but in a subtler way. 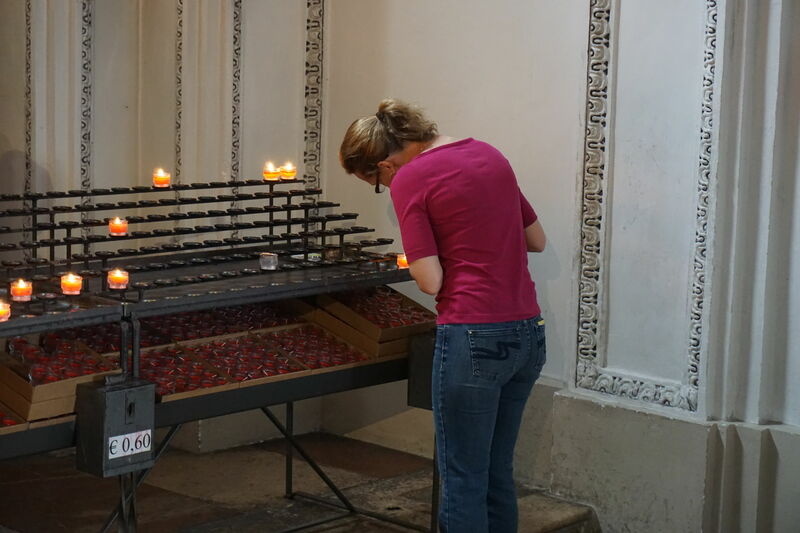 One of my favorite parts of the Cathedral was the crypts. I expected dark, a little creepy and maybe something a touch different. What we saw was amazing and not anything I could have thought of. After the church we decided we had to see the fortress. Just the sight of it sitting on he hill reminded both Bob and I of Edinburgh (still my favorite city). We were going to take the tram up (it is a steep and long walk) but sort of missed the ticket area. So … we walked. We stopped a few times for a picture of two of the views because they are that beautiful. 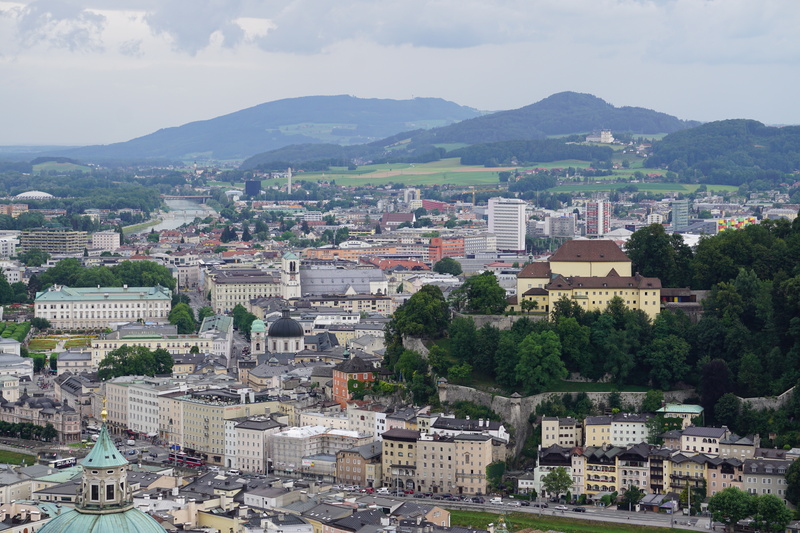 But when you get to the fortress itself, and look out over Salzburg, you are truly impressed. Luckily we made it up to the castle and through most of the open areas before the rain started in earnest. We were up at the highest point in the castle when the rain and wind kicked up and we decided to continue with the interior portions of the castle. After walking down the hill (cannot take the tram just down) we wander across the river and stopped for coffee and a brownie so we could warm up, dry off a little and just rest out feet. After our break we headed to St. Peter’s Monastery. 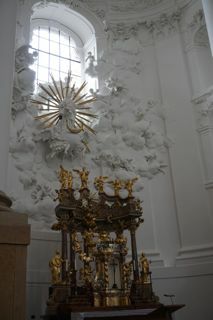 The church here is small, but once again, elaborate and detailed. The most impressive part to me was the cemetery: the graves are all so well maintained and if you didn’t notice the markers (although how you could miss them, I’m not sure) you would think you were In a beautiful garden. 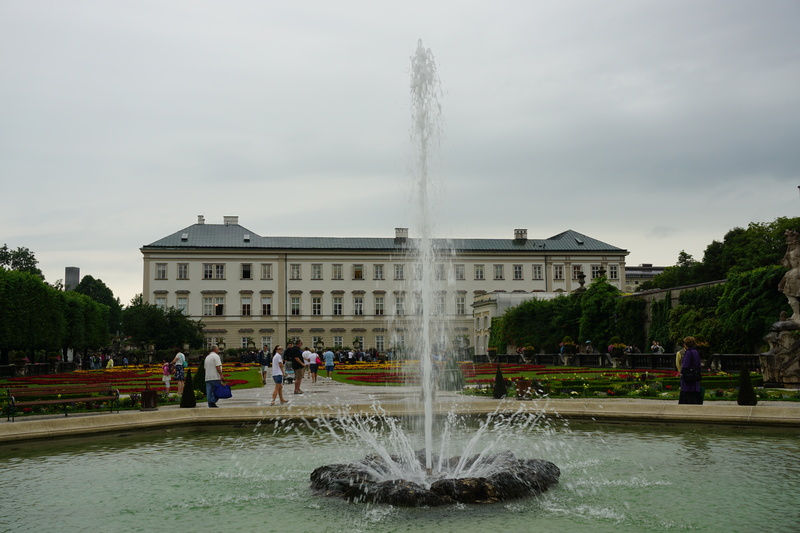 Speaking of beautiful gardens … Since we had time before our dinner, we wandered to Mirabell Gardens where parts of The Sound of Music were filmed. Erin. I took this photo just for you. The gardens were gorgeous. They were well maintained and manicured to perfection. 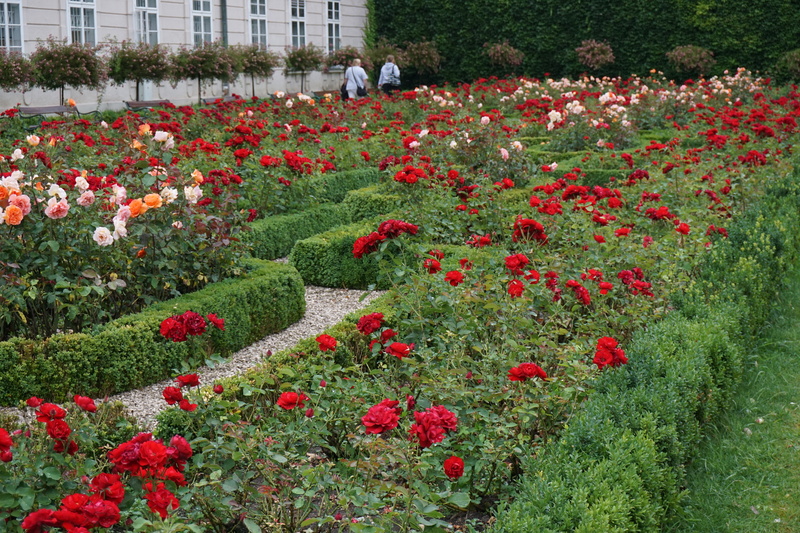 The roses alone were stunning, but the effect of the overall garden is pretty special. We had dinner at the restaurant at St. Peter’s Monastery. The restaurant has been open since 803. Yes, 803, not 1803. I’m sure it has not been a traditional restaurant since that time, but as it has served food to the public since then, I’m counting it. 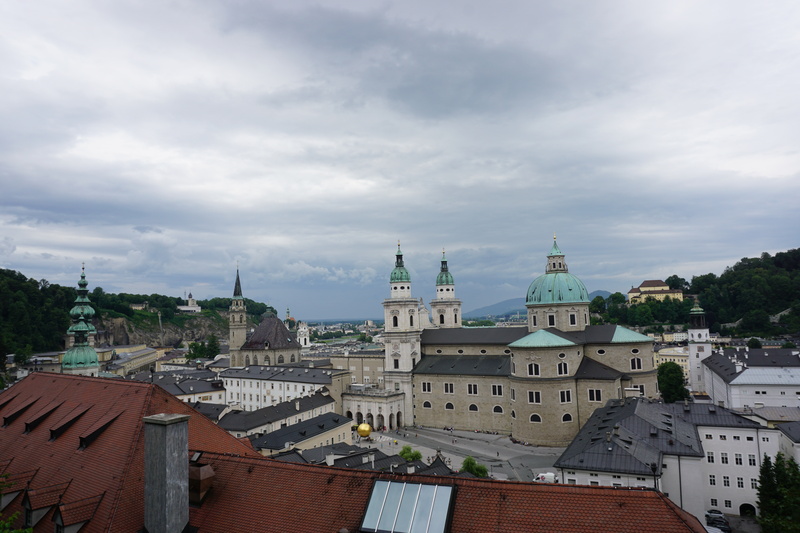 We did a lot in our one day in Salzburg. Possibly too much; I know we didn’t see everything. That’s ok, we go into these trips with a few things we really want to do and if we miss things, we miss them. We enjoy what we do and don’t try to do everything. So far it’s worked for us. You really should. It was incredible. I’d go back in a heartbeat.